NIA CHARLESTOWN NEVIS (October 07, 2014) — Deputy Premier of Nevis Hon. 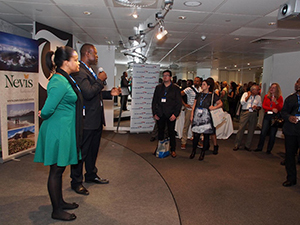 Mark Brantley and a team from the Nevis Tourism Authority (NTA) were recently hosted at The Telegraph on October 03, 2014, a leading newspaper in London on the final leg of the “Know the UK. Grow the UK” trip to England and Scotland. In a report to the Department of Information. Mr. Brantley noted that the group which also comprised of officials of the St. Kitts Tourism Authority and tourism partners on Nevis and St. Kitts were hosted at the newspaper for an exclusive rum-sampling event. 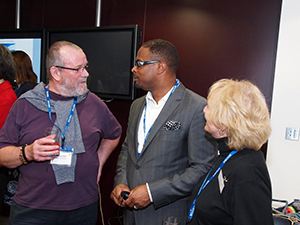 “This event was to meet with consumers at a rum-tasting at the office of the Telegraph newspaper in London. It was well attended and the NTA and tourism stakeholders on both island had an opportunity to mix and mingle with consumers and talk about the islands many and varied offerings,” he said. The Tourism Minister described the promotional trip as successful. “The trip was a tremendous opportunity for the 2nd year running to expose Nevis and what it has to offer to the UK Press and those involved in the travel industry. “Whilst in the UK, I met with journalists in Scotland and in London representing papers such as the Independent, The Herald and the Telegraph. It is our expectation to reap the benefits of this exposure through increased awareness of Nevis in the market place and increased visitor arrivals to Nevis,” he said. Mr. Brantley told the Department that the Nevis Island Administration would continue to promote Nevis at all available opportunities. “We continue our relentless efforts to get the word out about the incredible tourism product that Nevis has to offer. “My mandate is to grow this industry, so as to maximise the benefits flowing from it for the people of Nevis. Press exposure is a critical part of that equation,” he said. The Nevis Tourism Minister was accompanied by Chief Executive Officer of the NTA Greg Phillip, Julie Claxton, who is in charge of the U.K. and European market for the NTA and Sponge Marketing, the London-based firm which handles marketing and public relations for Nevis.